Farmer experience and university research agree that a good fertility program is a no-brainer when it comes to producing economic yields. But getting the fertilizer in the right place and in the right amounts is not easy. And how you sample your soils is at the root of good fertility decisions. Unfortunately the lower the soil’s fertility level, the more that getting accurate soil test numbers matters to the bottom line. 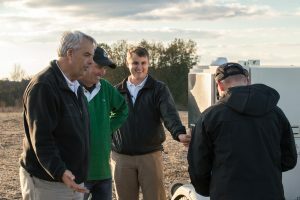 When soil fertility levels are high, a soil test that’s a bit off probably won’t negatively affect yield, even if it results in a P or K fertilizer application that is too low. But when soil fertility is low, getting the right soil test numbers can make bushels of difference. With the margin of error inherent in today’s collection methods, a test could show all is well when in fact fertility is actually a little low. That can mean fewer bushels in the bin. This error adds up, because a lot of acres have borderline P and K fertility. Falcon is the best possible way to know as close as possible where you really stand. The Falcon 5000 is coming to South Dakota! The Falcon 5000 at NY’s Empire Farm Days! How Much Do You Know About Your Soil? Precision Ag Technology is Advancing…Falcon Takes it to the Next Level!